If you are not sure what to do once your manuscript is ready, this free guide on how to self-publish your book will help you decide your next steps. The answer is complicated. That is because there are several options. To help answer the question, we have produced How to Self-publish Your Book: “the no-fluff guide”. As the title implies, this is not a long-winded tome. It is short and sweet and exists for one reason only: to help you decide which publishing option to choose. For that reason this book is not a step-by-step tutorial on any of the options. In fact, any publishing program you choose will have its own, detailed how-to guide. The one exception to this is traditional self-publishing, where you are the boss. There is no program, so there is no guide. How to Self-publish Your Book: “the no-fluff guide”, does go into much greater detail on traditional self-publishing, partly so that you will know what to do, and partly so that you have a full appreciation of all that is involved if you choose that option. 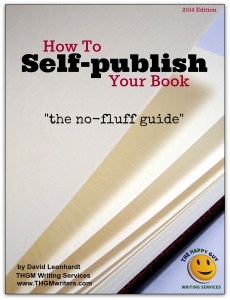 Download your free copy of How to Self-publish Your Book: “the no-fluff guide” here. If you are a blogger or have a social media audience that includes up and coming writers, please let them know about this guide to self-publishing. If you are a writer and you are not yet ready to publish, if you need a ghostwriter or editing help, we have a team of ghostwriters and editors ready to help you. Hi David! Nicely explained. Thanks for being an outstanding leader and showing the way to simply publishing a book with ease. Keep up the amazing work. Great advice to proffer, David! Thanks for the download, too! Hi David! I really appreciated your write ups. Thanks for showing me on how to publish the book simply. How I wish to be part of this venture. Hi, good points that every self publisher should be aware of. With the advent of self publishing software and abundant information on it, more and more authors are leaning towards self publishing their books. Thanks for the download.